Mordechai Nisan is a professor at the Rothberg International School of the Hebrew University of Jerusalem. He is the author of The Christian Decline in Lebanon (Ariel Center for Policy Research, 1999) and has written a biography of Etienne Saqr scheduled for forthcoming publication. Lebanon is a land of remarkably few ideological purists, a country where political allegiances shift rapidly and public statements are more often intended to mask, rather than elucidate, intentions. Etienne Saqr, the leader of the nationalist Guardians of the Cedars movement, is among the most notable exceptions to this trend. Seasoned observers of Lebanese politics would be hard-pressed to detect even slight ideological shifts in his speeches and writings over the past three decades. While Saqr has often been mislabeled a Christian nationalist because of his alignment with Christian militia forces during the 1975-1990 war in Lebanon, his conception of Lebanon is squarely secular (albeit decidedly Western) and the Guardians have always attracted a small cadre of Muslim supporters. The Christian community in Lebanon has long been plagued internally by vitriolic feuds and shifting alliances, yet few have accused Saqr of betraying an ally or compromising with an enemy. His cooperation with Israel, for which he has often been criticized, has stemmed not from the fleeting considerations that drove many of his Maronite Christian contemporaries to seek Israeli patronage, but from his belief in a natural harmony of interests between Lebanon and the Jewish state. In a culture where ideological flexibility is the name of the game, Saqr's political relevance is difficult to judge. There is no question, however, that he is greatly feared by the Syrians and their allies in Lebanon. The Guardians of the Cedars is the only Lebanese opposition group that is not allowed to undertake any public activity whatsoever in Lebanon today. Etienne Saqr was born in 1937 in the southern Lebanese village of Ain Ebel, one of eleven children reared by Caesar Saqr, a school principal. He was weaned on the memory of an infamous massacre of Christian villagers by local Shi'ite Muslims in May 1920, which claimed the life of his grandmother. Saqr acquired a French education typical of Maronite families in Lebanon, passing the years of his youth at schools in Tripoli and Beirut. After the death of his father in 1944 left his family without financial resources, Saqr was forced to forgo a university education. Instead, at the age of seventeen, he went to work for the Sureté Générale (General Security Directorate). This apprenticeship in national security, which saw him officiating at various posts along the Syrian border, influenced his thinking about the fragility of Lebanese sovereignty. During the early 1960s, he took part in the crackdown against the Syrian Social National Party (SSNP), a group favoring unity with Syria, which had carried out a failed coup attempt in 1961. In 1962, Saqr moved from the geographical and political periphery of the country to the capital city and assumed a position in the presidential palace. The next eight years allowed him to study the presidencies of Fouad Shihab and Charles Helou and reflect upon the problems of weak leadership. During this period, Etienne married his wife, Alexandra, from Zahle and together they bore two daughters, Pascal and Carole, and a son, Arz. In November 1969, the Lebanese government signed the Cairo Agreement, officially submitting to the armed Palestinian presence in the country. Exasperated by the government's inability to confront this growing threat to Lebanese security, Saqr left the Sureté Générale and went into private business, giving him the freedom to become politically active. He soon established a rapport with intellectual personalities who shared his anxiety about the impending calamity, such as the poet Said Aql (who he would later call his mentor). In the early 1970s, as the Palestine Liberation Organization (PLO) consolidated a "state within a state" in Lebanon and carried out terror attacks that provoked Israeli reprisals into the heart of Beirut, Saqr decided that talk alone was not sufficient. In 1974, he went to Baalbek to buy weapons and recruited a small group of nationalist-minded Lebanese to prepare for the dangers ahead. The following year, the group was formally established as the Guardians of the Cedars (Hiras Al-Arz). War erupted in Lebanon on April 13, 1975, when Palestinian gunmen opened fire on Pierre Gemayel, the head of the Phalange (Kata'ib) Party, at a church ceremony in East Beirut. The subsequent escalation of violence opened the floodgates to PLO brutality against the Lebanese civilian population, such as the murder of three priests at Deir Ashash in September 1975 and the slaughter of nearly 600 residents in the town of Damour in January 1976. Saqr (commonly known as "Abu Arz" in Lebanon) was not from a prominent political family and entered the public arena without a sound financial base or patronage network. Compensating for these deficiencies, however, were human magnetism, a defiant spirit, and an inclusive national vision. The Guardians conceived of Lebanon as a distinct non-Arab nation descended from the ancient Phoenicians, an idea which reflected the writings of Aql (who considered the Lebanese dialect to be a distinct language and introduced a Latinized alphabet for it). The group's platform called for absolute dedication to Lebanon's independence and the elimination of political sectarianism. Fouad Boustani, president of the Lebanese University, once stated that "clouds of doubt and black skies" were only removed with the appearance of the Guardians' "flawless ideology." In order to emphasize the party's nonconfessional ideology, Saqr made it a point to retain a number of Muslim bodyguards. In 1980, he chose a Shiite member of the Guardians to head its delegation to a Maronite League Conference in New York. Although the party's rank and file remained mostly Christian, this was not because of any incompatibility between the Guardian's ideology and the Muslim faith. Rather, it reflected the fact that Lebanese Muslims were less exposed to secular Western culture and tended to identify strongly with the Palestinian struggle against Israel. The Guardians of the Cedars militia, which fielded about 1,000 soldiers, became quickly and directly engaged in the conflict that descended upon Lebanon in 1975. Saqr's forces closely coordinated with the key Christian militias - Pierre Gemayel's Phalange militia, commanded by his son, Bashir; Camille Chamoun's Tigers militia, commanded by his son, Dany; and the Marada Brigades of then-President Suleiman Frangieh, commanded by his son, Tony. The Christian camp faced a loose alliance, comprised of Druze leader Kamal Jumblatt's Progressive Socialist Party (PSP), Lebanese leftist groups, and Palestinian armed factions bent on overthrowing the Lebanese republic. Unlike the oligarchic Christian elites, Saqr did not have (or seek to establish) an autonomous personal fiefdom and the Guardians did not center their military struggle around "turf" - they fought where they were needed. While the Guardians earned a reputation for ruthless actions on the battlefield, Saqr enforced tight discipline on its fighters and, unlike other militia chiefs, forbade his troops from looting. In March 1976, they confronted Palestinian and leftist forces in West Beirut. A Guardians unit was also dispatched to Zaarour, above the mountain road to Zahle, to support Phalangist forces. In April, Guardian fighters defended a line in the area of Hadeth, Kfar Shima, and Bsaba, south of Beirut, against a coalition of Palestinian, PSP, and SSNP forces. In the summer of 1976, the Guardians were among the first militias to assault Tel al-Zaatar, the last remaining Palestinian camp in east Beirut, which fell after a 52-day siege. Following this victory, Saqr led a Guardians force to Chekka, where Christians were being slaughtered by leftist-Palestinian forces. With his own hands he helped bury the dead. The Guardians and allied Christian militias then invaded the Koura region and reached the doors of Tripoli, saving Christian residents trapped there. Even as Palestinian and leftist forces wreaked havoc on the country, a darker shadow began to fall upon Lebanon. To the shock and consternation of Saqr and many other Lebanese nationalists, President Elias Sarkis and the Christian political elite began negotiating with the Syrians. Pierre Gemayel and Camille Chamoun even traveled to Damascus to appeal for assistance from Syrian President Hafez Assad, who was all too happy to comply. At the eleventh hour, Saqr invited major Christian political figures to a meeting and implored them not to cut a deal with the brutal dictator next door, but every one of them insisted on backing the entry of Syrian forces into Lebanon. As Syrian soldiers paraded into Lebanon in mid-1976, President Sarkis called upon Lebanese to greet them 'in love and brotherhood' and Gemayel's Phalangists lined the road to Beit Mery, throwing rice on their heads. The dominant Christian leadership naively believed that Assad would neutralize and eliminate the Palestinian menace within the country and return it to their stewardship. However, while the dictator had a short-term interest in preventing the takeover of Lebanon by Palestinian forces that he could not directly manipulate, Syrian forces entered the country not to expel Palestinian forces, but to bring them under his control and thereby consolidate Syrian hegemony over Lebanon. In the Middle East, the enemy of one's enemy is not always a friend. As the Syrian army began to encircle Beirut in November 1976, Saqr called a press conference and announced his intention to retreat to the mountains, along with his core supporters, as an act of protest against the defeatism of Lebanon's political leadership. Abu Arz and his inner circle trekked north to Laqluk, near Akoura, then moved to Tannourine in the Batroun region, again to Oyoun Es-Simaan in the eastern Kesrouan, and finally to the Metn region. More disturbing to Saqr than the Christian oligarchy's lack of resolve in the face of Syrian encroachments was its disunity. Intense competition among the Gemayel, Franjieh and Chamoun families sparked outbreaks of horrific bloodletting. In June 1978, Phalangist forces murdered Tony Frangieh and most of his family in a bloody raid that pushed the Franjieh family squarely into an alliance with the Syrians and led to 342 reprisal killings of Phalangists in the years that followed. In July 1980, the Phalangists virtually eradicated Chamoun's militia in a bloodbath that claimed up to 500 lives, mostly civilians. Disunity even pervaded the Gemayel family, as Amine set up a rival Phalangist power base of his own. Although Bashir Gemayel succeeded in uniting most of the militia factions under the banner of the Lebanese Forces (LF), the LF would itself become plagued by personal feuds. Realizing that his Christian allies lacked the strength of will to fight the Syrian presence (or even to stop fighting each other), in 1982 Saqr openly welcomed invading Israeli forces. Since the mid-1970s, Saqr had developed a public and amicable relationship with Israel that was unique in the politics of Beirut. Whereas Chamoun and Gemayel had sought and received Israeli military aid due to short-term strategic considerations and avoided public discussion of their ties to Israel, Saqr believed there to be a common destiny binding the Jewish and Lebanese peoples in the Arab-dominated Middle East and never wavered from expressing this view openly. After the Israelis forced the expulsion of PLO forces from Beirut in late August, Abu Arz indeed seemed vindicated. But Bashir Gemayel, seeking Muslim and regional Arab support for his bid to become president, refused to coordinate with the Israelis in Lebanon and denounced the Israeli bombing of PLO positions as "savage." Following Bashir Gemayel's assassination by pro-Syrian operatives in September1982, the presidency passed (at the insistence of his father) to Bashir's brother, Amine. With the firm backing of the Reagan administration in Washington, the young president negotiated an agreement with Israel on May 17, 1983, that promised to bring peace and tranquility to the South once again. After the withdrawal of American and European peacekeeping troops later that year, however, Amine Gemayel lost his resolve and refused to ratify the treaty. In light of Gemayel's unwillingness to cooperate with Israel in securing the south Lebanon border region, Saqr encouraged Guardians fighters to join Saad Haddad's Israeli-backed Army of Free Lebanon, later renamed the South Lebanon Army (SLA). Guardians forces under the command of Joseph Karam (aka Alloush) played a key role in defending Christian villages in 1984-85, though many hamlets were nevertheless overrun. Abu Arz continued to maintain neutrality with regard to the internecine quarrelling which continued to plague the Christian community in the 1980s, particularly the rivalry within the LF between Samir Geagea and Elie Hobeika. While Saqr opposed Hobeika's attempt to lead the LF toward accommodation with Syria (which culminated in the Tripartite Agreement of September 1985), he was greatly disturbed by the fighting which broke out between pro-Geagea and pro-Hobeika forces in late December and persuaded Army Commander Michel Aoun to intervene and prevent the slaughter of Hobeika's men. In part because of his efforts to stop the bloodshed, Saqr was invited by Camille Chamoun to join the newly reestablished Lebanese Front, the political body parallel to the LF. The eruption of violence between the Lebanese Forces and General Aoun's army units in 1989 placed Abu Arz in a very difficult position. While he had been instrumental in the founding of the LF in 1976, he disagreed with the narrow Christian ethos that came to prevail within it and sympathized with Aoun, who enjoyed broad support from all sectarian communities. Seeking to bring an end to the bloodshed, he mediated between the two sides when Geagea's fighters were defeated by army units in Monteverde and Beit Mery in the Metn region. At the time, Abu Arz was present daily at the presidential palace at Baabda with Aoun. Abu Arz firmly supported Aoun's declaration of a war of liberation to oust the Syrians in March 1989, though he questioned the lack of political strategy to assure success. Syria by that time had received firm American support for its occupation of Lebanon, which was further legitimized by the October 1989 Taif Accord. Abu Arz implored Aoun to seek Israel's assistance, but the general refused and persisted in condemning the Israelis nearly as loudly as he condemned the Syrians. 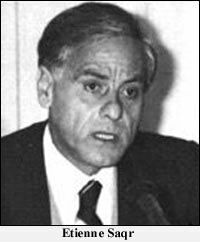 Nevertheless, Abu Arz formed the Broad Front for Liberation and Change as a political cover for Aoun's military struggle. After the LF accepted the Taif Accord in 1990, he and his family were placed under house arrest by LF forces. He was later forced to leave Beirut and went to live in southern Lebanon. Rather than joining Amine Gemayel and other notable Maronite exiles in Paris, Saqr decided to relocate to the southern border region under the control of Israel and the SLA. Over the years, Etienne secretly visited his family and party members twice in Beirut, avoiding the eyes of the ubiquitous Syrian mukhabarat (intelligence services). Although Abu Arz conducted political activities from Sabbah, near Jezzine, during the next decade, he was not allowed to play a military role. In February 1998, he wrote a four-page proposal calling for the transformation of the security zone into a launch pad for the liberation of all Lebanon,2 but Israeli military commanders and their SLA counterparts would entertain no thoughts of offensive action. As Israeli public support for a unilateral withdrawal from Lebanon increased rapidly toward the end of the 1990s, Saqr vigorously lobbied the Israeli government to allow the transformation of the SLA into an autonomous force capable of fending off Hezbollah attacks after the departure of Israeli forces, but to no avail. Taking his appeal to the United States, Saqr addressed a Lebanese-American conference in Washington in June 1998 and testified at a congressional committee hearing in February 2000. In May 2000, Israeli Prime Minister Ehud Barak ordered a precipitous IDF military withdrawal from south Lebanon, without warning SLA commanders, leading to the collapse of the militia and the flight of around 7,000 Lebanese, including Saqr himself, into Israel. Addressing a group of Israeli parliamentarians in the Knesset a few days later, Etienne rebuked his host country, charging that Israel had "made heroes out of Hezbollah." Since the Syrians completed their conquest of Lebanon in 1990, the authorities in Beirut have constantly cracked down on the Guardians of the Cedars. Saqr himself has been sentenced in absentia to death by a Lebanese court on charges of "collaborating with the Zionist enemy." Those members of the Guardians in Lebanon who have openly identified themselves as such have been indicted on similar charges. Indeed, the authorities have assaulted and jailed many Lebanese purely on the basis of having met with Saqr. In 1996, a journalist for the daily Al-Nahar, Pierre Atallah, was brutally beaten by plainclothes security agents after meeting with him and forced to flee abroad. In August 2001, Lebanese security forces arrested Habib Younis, the former Beirut bureau chief of the London-based daily Al-Hayat, and Claude Hajjar, a prominent human rights activist, on charges of plotting with Saqr to organize opposition to the Syrians. Despite the enormous personal sacrifice he has been forced to make, Saqr remains defiantly opposed to the Syrian presence in Lebanon and continues to insist that he will "bend only to God." Mordechai Nisan, Did Israel Betray Its Lebanese Allies? Middle East Quarterly, Vol. 7, No. 4, December 2000. 1 The Jerusalem Post, 23 July 1982. 2 The Jerusalem Post, 12 March 1998.